If you’ve been searching around California for a car dealership that’s different in all the best ways, then coming for a visit at Clawson Honda of Fresno is going to a be a breath of fresh air. We’re a family-owned dealership that’s happily served the Fresno area for more than 40 years, and in that time we’ve had the ability to refine our processes and learn about just what it takes to exceed customers’ expectations. Visit soon and we’ll be glad to show you around the facility! The new-car inventory at our Honda dealership near Clovis, CA, is sure to impress all who come looking. Whether you want a pre-owned car to get around in or a brand-new Honda car, truck, SUV or minivan to improve your daily drives, we have it all. From new Honda sedans like the Civic to SUVs like the new Honda CR-V to all the other models in between, it’s easy to find a ride you love on our lot. We also have used Honda vehicles and pre-owned cars from other makes, ensuring that you have plenty of options. 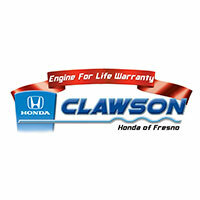 Find out which one is right for you by coming in for a test-drive at Clawson Honda of Fresno. When you need professional auto service or financing advice, you can always count on us. We provide fast, efficient Honda service so you can keep your car running smoothly with little interruption to your routine, and you can schedule service online for added convenience. If you want to learn more about Honda financing and leasing, spend some time with our finance specialists to gather information. Just let us know how we can be of assistance and we’ll work hard until you have a solution! Come find us at 6346 N Blackstone Ave in Fresno, CA, just a short drive away from Selma, Madera, Modesto and throughout California. We look forward to meeting you!